Getting ripped abs is a goal you can reach. However, it will take time, structured effort, and a proven program. 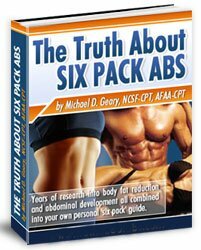 You will need progressive strategies to burn belly fat and increase lean muscle mass. Making good food choices and intense, but brief workouts, must be included. Setting a goal to get ripped abs comes with several mental hurdles. You can get past them, but you have to be realistic about them presenting themselves. * Perhaps the toughest initial hurdle is that you WILL LOSE SIZE. That's the reality of a reduction in body fat percentage. * Fat will come off over your entire body. There is no such thing as targeted fat loss. However, as you become more lean...you will LOOK heavier and definitely look more muscular. * The 2nd major hurdle is learning to eat consciously. Like professional and Olympic athletes, you will have to learn to evaluate everything you put in your mouth and ask yourself, "Will this food increase lean muscle or will it be stored on my abs as fat?" * Many guys do not want to adhere to this type of self-discipline. They want to still eat whatever they wish, or they want cheat days of gorging. You can make it past this immaturity. Getting ripped abs is not for soft men. * The 3rd huge hurdle is understanding that burning enough fat so that you can see the striations of your abs WILL TAKE TIME. Fat loss and lean muscle gain is progressive, it cannot be rushed. This will NOT be a 4-6 week project. * It must become a lifestyle. You must truly desire to look more cut, more fit, and more muscular than the guys you hang around with. Dedication to making good food choices and working out intensely takes self-discipline. * Your last hurdle will involve brief, intense workouts that center on strength building lifts and cardio that focuses on interval training workouts. You will engage in cardio that parallels workouts of professional athletes. Getting ripped abs means you will be training much differently than your friends and the other guys in the gym. What do women find attractive about a man's body? Does P90X work? What makes it so popular?